Introduction I am going to take you into another world, one that is somewhat real, that is not in the future, but that is actually going on today. I want to just give you a sort of framework, in which the information highway in North Carolina is being discussed and it is basically within the framework of a national information infrastructure in the United States. The Inner Eye I would give you very quickly some of the visions, the goals, that the inner eye has adapted as a draft. We will now have to go out to citizen across the United Stated in a comment session for the next four months and we will come back by the end of this year with a report to the President and to the Vice President with the inner eye goals and principles. The inner eye, a council that is made up of about thirty-five individuals, I say about, because we originally had twenty-six. We ended up with five or six additional people who are on, but who may not come to our meetings. So we say, we have about thirty-five people. There are around twenty-seven of us that are really very active and they work about at least a full day a week to this effort nationally and some of us give more time than that. The inner eye is divided into three projects. The mega projects address basically the following areas: I co-chair a mega project on vision and applications. The second mega project is co-chaired by Bert Roberts, the president of MCI and a state senator from (?) and they look at the universal service and access issues of the inner eye. The third mega project is co-chaired by John Cook from the Disney channel and (?) from the Electronic Frontier Foundation. They look at intellectual property, security and privacy. Each of these mega projects work independently of each other, but we come back together before we get sign off on our principles. The first set of overall principles as well as principles within each mega project is, that we go into report called common ground (§). We came out with a draft of that now. It will be signed off and go out for comment in about three weeks. Why are we interested in this? You heard the comment about those people who go into to the internet. Well we do think that the countries that get their people up to speed on information highways and have connectivity across their country, not just their cities, but the rural areas as well, will enhance tremendously the quality of life of the citizens of their country, but at the same time will also make their companies more competitive. So that is a very strong focus of the inner eye in the US: enhancing the quality of life, but also making the US more competitive in a global market place. A Few Figures I want to give you a few figures before I start on showing you our information highway in North Carolina. First of all - I am sure someone just told you that the amount of money that this entails in the year 2003 will be 3 Trillion Dollars. That will be the amount of money in the world-wide telecommunications revenues at that time. In 1993 at the end of the year we got 700 Billion dollars in revenues in telecommunications across the world. The average age of the internet user in 1994 is twenty-six, the average age of the internet user in the year 2000 will be fifteen. In our country we refer to all of our students coming up as nintendo intelligent at least in our schools, and we know that the age of the internet user has been driven down considerably. Why is that the case in the US? - Today in the US 89% of the households have televisions, we have 95% that have basic telephone service, households with VCRs 85%, households with cabel television 63%, households with a personnel computer in the US today are 35%. The higher the income obviously the higher is the telecommunications infrastructure. Among homes who have an income over 100.000 Dollar in the US, the chances are, 65% have a personnel computer. Among households under 20.000 Dollar that figure drops down to about eleven percent. I wanted to give you that figure because that is very important to us. Computers are a very important periphery, they are an attachment to this information highway, that is critical for you to be able to come on and off the highway. A Public/Private Sector Partnership In North Carolina as a state we have always been looking ahead trying to make sure that our people are able to be better educated and also to be competitive as a state with the other forty-nine states and a number of territories in the US. What I am going to show you tonight for North Carolina is not the first, this is really the second go around for us. The first go around was in the early 1980s when the state committed to be in partnership with the private sector and to build the first digital highway in the country. The state of North Carolina has been fully digitally switched since about 1987, that means central offices were fully digitally switched. We were able to do this by leveraging the power of the state, being a major customer of the telephone companies. We have twenty-eight different telephone companies, three of them are very large, one is Bellsoft, which is an extremely large company in terms of our state. Second is GTE and third is Sprint Carolina Telephone. There are thirty-five other small companies, of which some are independently owned by mums and paps, people who just wanted to be in the plain old telephone service what we call pots in the country. The people who run the service also have been involved in helping to develop this highway, they all work together. The North Carolina information highway began as an ideas about five years ago. The information highway, we sell it. That is not something you deploy in your state or your country without selling it. This is something I want to get across to you. If you think, your people and your villages understand this, think again. They do not. They do not in North Carolina even though we have been talking about that now for three solid years. So it is not an easy thing to get across. The highway we wanted to see built was a public switched broadband network capable of transmitting data, text image voice and video with the potential to provide benefits in the areas of education, health, medicine, criminal justice, economic development and government operations. It is the most advanced ATM/SONET network in the world stretching across 700 miles. You will see a little later that we have actually eleven big ATM switches that are not just in the cities of North Carolina. One of the big issues for our state was that the rural areas must have the same equity as our cities. We started with public projects. We went to companies and we said let's talk about some public projects here in North Carolina. The (§) project had four or five major corporations involved with it, Vision Carolina had three major corporations, Impact North Carolina had another couple of major corporations and (?) is a creature originally of the state. It was called the microelectronics center of North Carolina. We created a non-profit organization of which the state is really an investor. To give you an example: With NC-REN we have been providing interactive instructional television across our state, to our major universities for the last twelve years. There is also a micro electronic center and our super computer in the state resides here in the research triangle park with NC-REN. Our super computer is accessful by both, government and corporations. Corporations pay a fee, if you are a researcher at a university, or you are a student in a high school, it is free to you. You apply and you go through the basic kind of peer reviews, but it is free to you as a student or a researcher, but corporations must pay a slide-in scale fee. These are the pilot projects where more than probably 150 people were involved. Later we started working with a larger group called the NCIH steering committee in which about 500 people have been involved within the last three years. Even with that group we have not got the message across to everybody in North Carolina. I keep bringing this up, because selling the information highway is not very easy. Our vision was to provide equity for urban and rural North Carolina in the delivery and accessibility of all the services that you see here. The highway is a public private sector partnership coming from the state side and the private sector side. government These are applictaions in the area of government: video conferencing will reduce costs for us, legislators will have access to citizens in an interactive environment. People work together here on broadcast television quality. We are now in pilot projects with the federal government where we are trying to integrate federal state and local ability of our peers to talk with each other across the federal government. The US post office is now working with us on some pilot projects within rural post offices. Education and Training The real emphasis is the power to transform the learning process. Let me give you an idea: Think about a student in a rural part of North Carolina where I grew up . Biology didn't exist as a class there. Think about having to keep labs up to speed, think about what happens in terms of equipment, in buildings, in teachers. We don't have enough certified biologists to teach in North Carolina in all of the rural areas, if we could pay for everyone. So we began to say, how do we shift this information and get our best teachers working with students. We worked with universities to create virtual frogs, 3d image frogs, that we can shift down the network to a school and with computers dissect frogs. We don't have to have all of the extra lab equipment and keep it up to date. We are thinking a different way about the education our students. The teacher becomes a coach, a co-learner. It is a totally different learning process than the typical lecture process that we have had in North Carolina. Our teachers and our cl assrooms find, that they have better discipline, they would learn material faster, they cover a larger amount of material during a shorter period of time and the retention rate is much much greater. We have researched to back this up. Distance learning gives an example of how we now can take students from North Carolina to the information age exhibit and actually have them in conversations with the students at nine or ten sites on-line at the same time across the state. Students from the mountains seven hundred miles away from their fellow students on the ocean can talk away three hundred miles to Washington and get into real time discussion about issues and processes of the information age. We can do the same with our zoos, our high school science, mathematics and we can also have teachers team teaching with each other in physics. One of the best examples though is in English, in creative writing where a teacher team teaches with a professor at the university and works with students on how you actually approach the whole writing process. It is interesting to that the professors at the university having to deal with high school teachers in our state. That has not been the case in the past except when they were being taught at the university. One of our biggest issues is re-training of our teachers, so that the teachers have the ability to use the technology and understand how to use it. That is going to be an issue in Austria as well, I would think. It is a big issues we are addressing at the national level right now with some special foundation studies that are going on in the county. For the distance learning we have ATM far servers that are able to pull down information regionally in digital video. We provide support from central support staffs across the state that support not just the schools, also the hospitals, also the criminal justice, the sheriffs and so forth. A regional support team that works with an ATM network here. I will give you another example of remote classrooms and teaching: last week we had 127 courses taught across the highway in North Carolina: calculus, computer simulation, science in the mind, students on line and interaction classes with students in Kenya. We are doing lots of international work with our students. Recently we had some students in from England, that we are working with to get tied into us. We not only use this for computer date, this is interactive to video audio. Libraries One of the major areas of concern to us are our libraries. We thing that the citizens first point of access will be from the library. In North Carolina we do not think that we as a state should be pushing to get into the home with full time ATM service For a good while that will not be the case. But we think that our citizens that can not afford a computer from home can in fact go to the library and access work stations, not just a 486, but a more sophisticated work station that will enable you to learn how to endeavor the networks. Our librarians in our country are the most intelligent surfers on the information highway. They have been trained at a much higher level than any of the other professions in our country. So they are doing a superb job. We are putting kiosks within the libraries for access to information. To give you an example: you can get your drivers license there rather than having to go to a separate place. That means you can shut down drivers license facilities. So we really can provide a mu lti media information access system through the highways at the library site. Telemedicine I am getting to telemedicine to give you more of an example of that. This is perhaps one of the most interesting and most cost effective ways for us. I asked how many people were imprisoned in Austria and I didn't get an answer, but in North Carolina we have crime like within most states and we have 26.000 people in prison. If you imprison someone you cannot put him in there and not give him good medical care. One it is wrong to do that and two you get sued. So we have found that to take a prisoner out of the prison for one day the cost of guard etc. is 750 Dollars. We were able to bring them the best professors from our medical schools to their on-line physical exams through an interactive telemedicine process, using digital stethoscopes, with the use of transmission of x-ray and also the ability to do testing within the prison and transmit it digitally back to the medical school itself. The cost of that medical consult amounts to 75 Dollars, there is a big difference to 750 Dollars just to transport the pr isoner and to find a doctor that is willing to treat the prisoner or a hospital that is willing to take you in with guard, when you are with a fellow that has murdered four or five people. So this telemedicine effort with the prison has been very popular with our legislators. it helps us solve the ? side of the highway more. Another area of telemedicine. We have very rural parts in North Carolina, I am not sure if Austria has anything as rural as we have in North Carolina. We have some areas where a doctor who is by himself is out practicing. The doctor gets very isolated form the rest of the professional community. This enables us to put that doctor directly on line with professionals that may be three or four hours away and may help him to provide consultancy and to also help them work through particular issues with patients in that area. Also the direct connection with diagnostic equipment is very very important. And we have some very sophisticated means. One of our most interesting ones that our doctors across the state like is a remote diagnosis and analysis. This is where we take a patient who may have a tumor, who goes to a eneomr?ar cad scan. We are able to take that person who is going to receive radiation therapy, take their tumor, ship their energies to our super computer, model it in 3D and come up with a protocol for that patient. That normally would take the doctor about 36 minutes. So the telemedicine aspect is very important to someone who lives in the mountains of North Carolina and doesn't want to drive five and a half hour to the University of North Carolina Chapel Hill. What really sells us is economic development. In North Carolina we have the lowest unemployment of any state that is our size in the United States. This is not something we have done lightly. We have worked very hard to do this and we have a very sophisticated form of economic development, of working with industries in training providing their geographical information systems access, employment date real state availability labor statistics, department if commerce date, education information, environmental information and infrastructure data access. We are able to assist them in coming up with packages to give to companies that are interested to coming into the state, or in providing just in general information for existing companies that want to grow. We are now finishing the full development of a distributed network for economic development that rides on servers. our state has such standards for the whole state TCPIP as our protocol that everyone in the state must abide by in terms of the computer and we ar e now able to work directly with the county government, and state government as we build with these servers that are providing information across the state. Economic developers automatically get access to the internet they are actually working and learning how to use all this equipment is not easy. It is a training process of monumental proportions to educate everyone and to learn how to serve through the internet or in fact how to learn how to ? data and to create knowledge. It is a training process of monumental proportions to educate everyone and to learn how to serve through the internet or in fact how to learn to how to ? date and to create knowledge. Having a plateau (?) of date is wonderful, but using it to create knowledge is what you really need to be able to do as well. This is typical example of our integrated criminal justice information system. In our state someone who is brought before a judge may get as many as five different numbers assigned to him. We have a state bureau of investigation give them a number, the sheriff may give him a number, they may get another number of the federal court, they may get another number of the ?. We are now trying to integrate everything from the police, the cops, the sheriff, the magistrate, the judges, corrections, parole. A policeman will have a digital camera mounted on their dashboard and when they stop someone it automatically takes the picture, it digitizes that and ships that through the network wirelessly into the terrestrial ATM network. So this is a difficult task, because it is turf, we use the word turf for organizations that have problems, that compete with each other, they have turf. Each of these has their own turf they guard very carefully, but the one thing they all wanted was this kind of sophisticated network. So they are working together to create this network, and they are learning about each other as they work together. The difference between North Carolina and the rest of the country in all of this is that everybody is working together. It is not just the criminal justice folks, but our Highway itself brings everyone together. Our teachers work with everyone in the criminal justice field, the criminal justice and teacher people work with our cultural resources, our librarians and our museum directors, they learn about each other and they work with the economic development people. It is a totally interesting environment, where people learn that they really can cooperate across these profession, where they have been divided before. And probably the toughest ones to learn to get along with are the medical doctors, the professionals that are in this arena, but even the medical doctors have learned that they have to be involved in work with our librarians and our artists and our musicians. One of our most interesting applications has been doing media (?) across the information highway with the chorus coming in from different sites. So we use this for all kinds of applications, not just for the hard applications that some people would sell the highway for. To give you another example of why this highway is so important: you can in fact write on this in all different speeds. You can ship date, you can ship image, you can ship video text and you can come on at 56 KB or you can do imaging on a medium lane at 10 Mb. We take to our schools 155 megabits. But our highway allows us all sort of working together in this very broad band and also our commercial companies are on line with us as well. We are 25 percent of the total usage of this highway, but because the state was willing to be an anchor tenant. Like in a mall where you have an anchor tenant we were an anchor tenant on the highway. That enabled the companies that were building this to go ahead and deploy this early. Now we have commercial tenants coming on the highway, it is the first commercial ATM sonnet highway in the world and we have large corporations coming on and small companies that are pushing very hard to get on the highway. They see this as a way for them to become competitive very quickly. To show what kind of information you transmit across the highway: it takes three and a half days now if you are working at 9600 BPS to ship 33 volumes of Encyclopedia Britannica across, if you move out to 56 KBPS it would take 14 hours, 31 minutes at 1,54 MBPS. For our schools it takes 18 seconds to ship all 33 volumes, I can ship one piece in less than two tens of a second from North Carolina to ?. So it shows that you do really have a capacity to damler (?) a tremendous amount of information from libraries, you don't have to buy all this, you can share it in a very sharing environment. Our speed go out to 2.4 GBITs with the next software upgrade. So the highway in North Carolina is moving ahead very fast. This shows you: North Carolina is about the size of Austria, has about the same number of people in it, we are about seven million. These are all witches, not just in cities, these are across the whole state in North Carolina. So there is not a citizen in North Carolina that is literally more than about 6 miles from the ability to connect on. What did the telephoen companies do for is? The telephone companies agreed in a contract with us, they will sign any school on in an installation no matter where it is off the backbone for a thousand dollars. If it costs two million dollars for fiber to get there, the charges are thousand dollars. We have a cost per month for the highway for these speeds, the cost for what I call the local exchange carrier and the long distance carrier. Any site here can go anywhere in the state. They can schedule on the ? schedule as an on-line scheduler, I want a class with the university in North Carolina ? I am up here in the mountains in Ashville. They can do that themselves, they can decide their destiny and where they want to go, just as the kids last week went to Kenya and they make that decision themselves. We do not control them from a central point. That is a big difference in this highway and one that I think is key - that you have to be able to control yourself where you are going, and that is true for instituti ons as well as for our citizens. We feel that we have a technology in the state that enables us to work with you wherever you are and whatever system you work with in the country or in the world. Our vision of the global information highway in this we define by the ability to interact with all kinds of technology. The ATM technology can do that. We have been proving this technology and so far this technology has not failed us one second, which is then quite different. Other people talk about it, but they have not had the kind of connectivity and this kind of network that we put together in North Carolina, the other thing is this: our goal is a global knowledge and service highway. It is not just connecting, but to really gain knowledge from this highway across the whole world and to connect up with folks across the world. North Carolina is working with Japan right now to create a II (?) linkage with our schools and are working with Israel and Africa to create that. We are looking for a site in Europe to connect with us. We think we bring a lot to this, because we bring a lot of background and knowledge in applications. We have four states that are working together in the south to actually link our own networks together, so that we have a regional inner eye. Our conclusion is this. We have been able to prove that you can partner with the private sector and get good rates. Our rates are a third of any kinds of rates that most companies talk about quoting for long distance and for local carriers. We think this far we will have those rates down to 2000 Dollars, because the state will pick up the long distance portion. Our suppliers, our carriers and our users not only must work cooperatively, they are required to work cooperatively. We require open access, we require interpretability and we require them to work in as closely as possible in a now proprietary environment It is quite a lot of fun to work in all of this. It is the first network of its kind in the world. It is based on national and international standards, it is optical fiber and sonnet for the electronics, it does provide sufficient bandwidth for any application we have come across. ATM switching allows the flexible use, if you remember the highway with all the different speeds that I showed you and the NCI does support a complete range of applications and it can grow as our user needs an applications grow. Let me say one thing that is really important to finish up. We could not have done this without doing what I call going to communities, rural communities across the states and getting their schools, their medical institutions, their criminal justice facilities, their universities, their technical universities, technical colleges, their libraries getting their local governments together and getting them to come together what we call integrated community meeting. Where they met to design how they wanted to use the highway, how they planned to work as a regional partnership network, and to work with other villages and communities in North Carolina. People understand if you take it down to the local level and say, you will be able to get medical care at the best hospital in North Carolina here in your local hospital working cooperatively between the specialist and the doctors to a local area, so we found that worked very well. One of our biggest problems were our legislators who don't seem to understand. It has been a one and one situation where we had to talk to them. Then the issue was what is it going to cost. No one in the world had tried it, so we didn't know what the cost was, but we had to come up with the costs. Or how is it going to work technically. You couldn`t always answer everyone's question. I grew up in a small rural southeastern North Carolina town. Where I got my books was from a book mobile that came around. That is where I learned Kierkegaard, I got his books when I was thirteen years old and I am a christian existentialist as a result of Kierkegaard. And this highway is a twenty-first century book mobile. Think of it that way. That is about the easiest way, I know how to describe it. There is a lot I could tell you about it, but I will only say this to you: it transforms the learning process in rural communities, it transforms the ability to get good access to medical care, you thing about the world in a totally different way. For our childs in south-eastern North Carolina to work with a child in Kenya . It changes your perspective on the world. 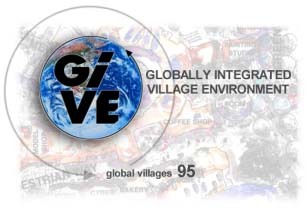 So the Global Village really does exist today, at least for those of us in North Carolina, our kids are really working with kids around the world and we would love a chance to work with Austrian children.